The MoU includes co-operation and information sharing on technical development, integrity, good governance and Member Association development. 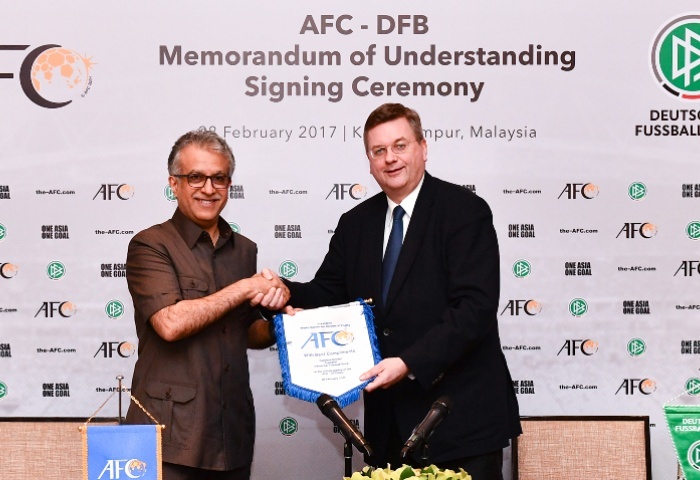 AFC president Shaikh Salman bin Ebrahim Al Khalifa met with German Football Association President Reinhardt Grindel in Kuala Lumpur earlier this week to sign the MoU. “We are grateful for this significant contribution the DFB is making to develop our game – both on and off the field. This MoU is an important building block for us to reach our objectives under the AFC Vision and Mission. “We are all united in our commitment to enhance the game globally. Cooperation and partnerships between our Member Associations are vital, and this MoU extends that approach beyond the borders of Asia,” said Shaikh Salman.